I have mostly stayed away from SLR cameras because of their sheer quantity and generally I don't find them very attractive, but I had to make an exception for the Exa/Exakta range. 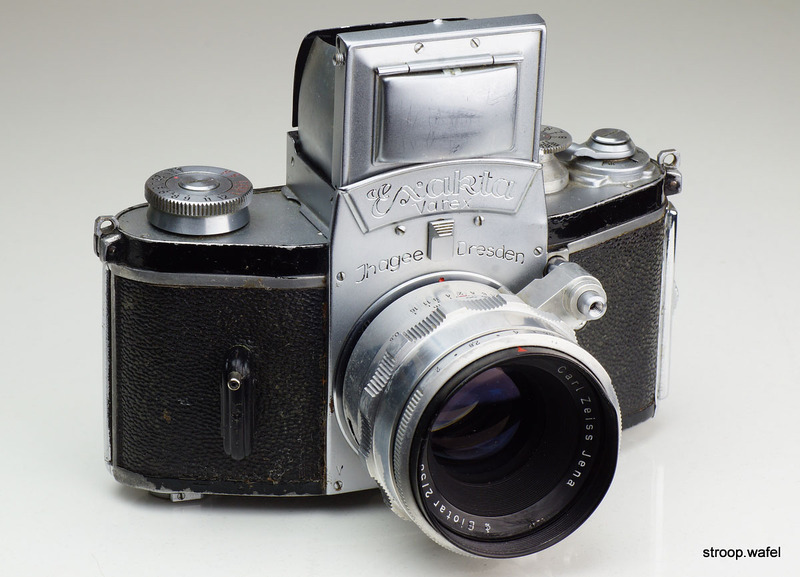 The Exaktas are a range of SLR cameras made by Ihagee in Dresden, Germany, which was in fact one of the first companies to design such type of camera. 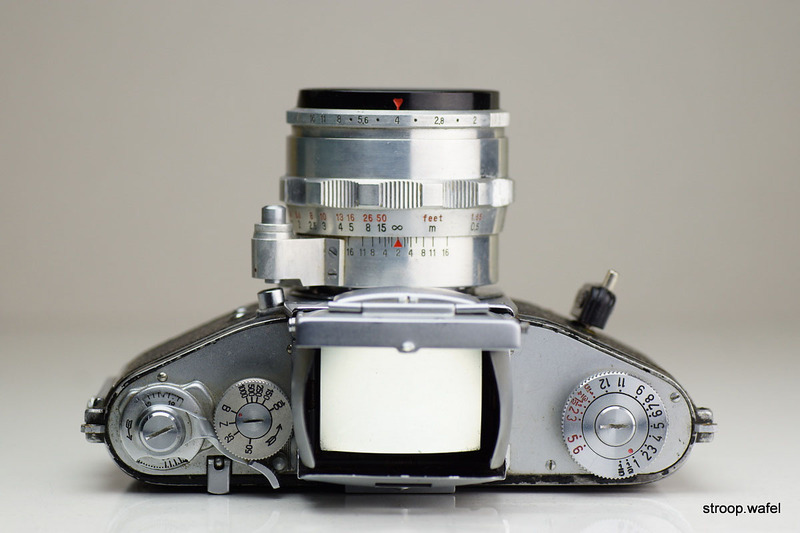 The benefits of SLR over view/rangefinder cameras are obvious, especially for exchangeable lens mounts. As one sees the scene through the lens one does not need different viewfinder for different lenses, and one does not need to worry about parallax for close subjects. As SLR is technically more challenging, it depends on the implementation if an SLR system is preferable over a good rangefinder system. Ihagee put their money on SLR early on and produced some beautifully designed but somewhat complicated to use models. 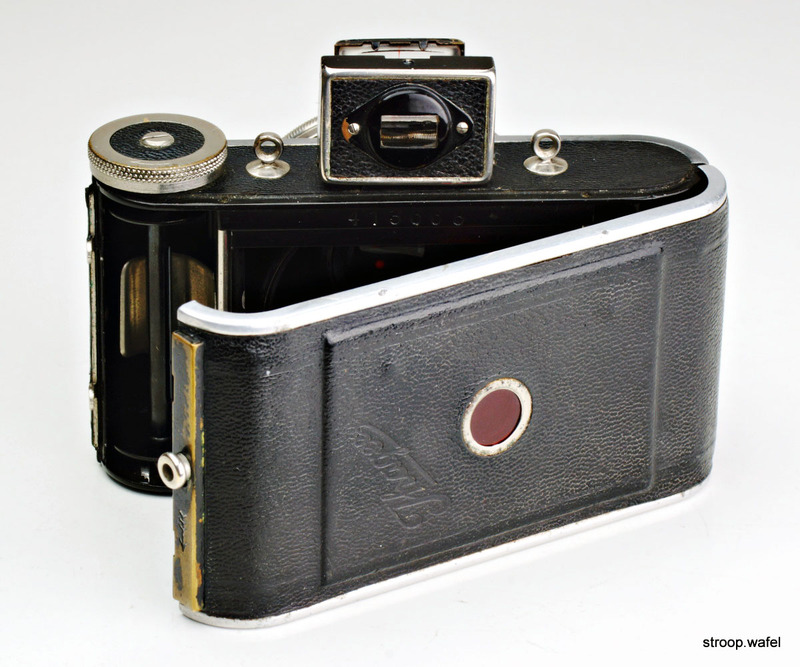 As the name indicates, the Ihagee Exakta VP used 'vest pocket' or 127 film. However, it certainly would not fit in your vest pocket! It was large and heavy, but had impressive features, most importantly the single lens reflex system with waist level viewfinder but also a large range of shutter speeds with a top speed f 1/1000 and a focal plane shutter. It came in several versions, a model A without slow speeds, a model B with slow speeds, for which it had an extra wind knob on the right hand side, and a Junior model was available. 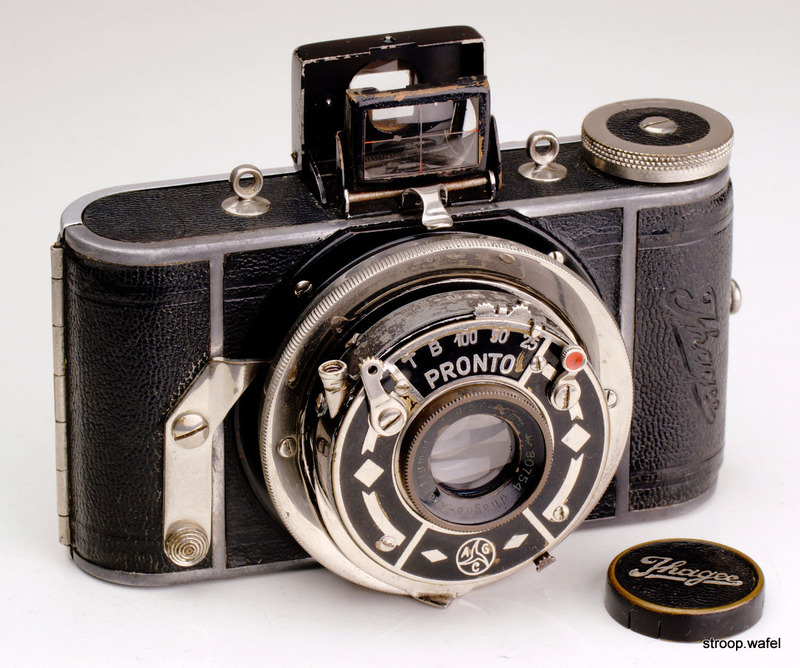 Both model A and B were available with plate back so it could also be used with photographic plates, these were later named model C. In addition, all these models except the Junior were available with a wider lens mount to allow faster lenses, the so-called 'Night Exaktas'. 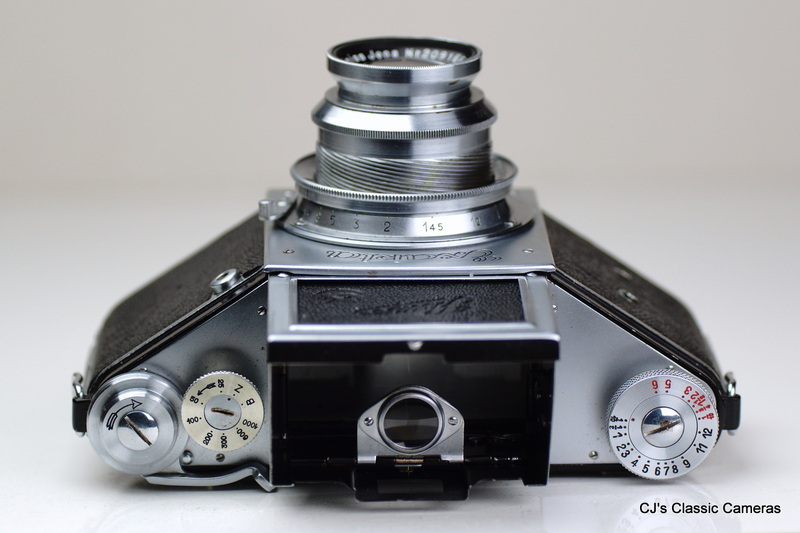 An Exakta VP model B with Carl Zeiss Jena Tessar 75mm f/2.8 lens. Note the long focal length of the lens, after all, these cameras had a 6x4 film frame for 8 exposures on 127, as opposed to most later 127 film cameras, which were in 4x3 format and had lenses of around 50mm. Although the lens mount was not meant to be interchangeable (no long or short lenses were available), the lens could be unscrewed from the body. Of course, the lenses would only have an aperture control and no way of focussing, as focussing was done using a helical mount on the camera body. This way the lens could also be retracted beyond its infinity point to make the camera smaller for storage. An interlock avoided the shutter to be fired with the lens retracted, which demonstrates the attention to detail that went into the design of these cameras. The first Exakta VP was introduced in 1933 and continued until WWII, production was not resumed after the war. Top view of the Exakta VP with lens extended until its infinity position, showing the camera's characteristic triangle shape. Also note the presence of a wind lever, a rather unique feature at that time in general and for roll film in particular, and the slow speed knob at the right, which allowed timed exposures up to 12 seconds! Rear view of the Exakta VP, showing the spy window needed to check on winding the roll film. The window cover had a spring so it would stay closed to avoid fogging the film. And finally, the interior of the camera showing the large focal plane shutter. 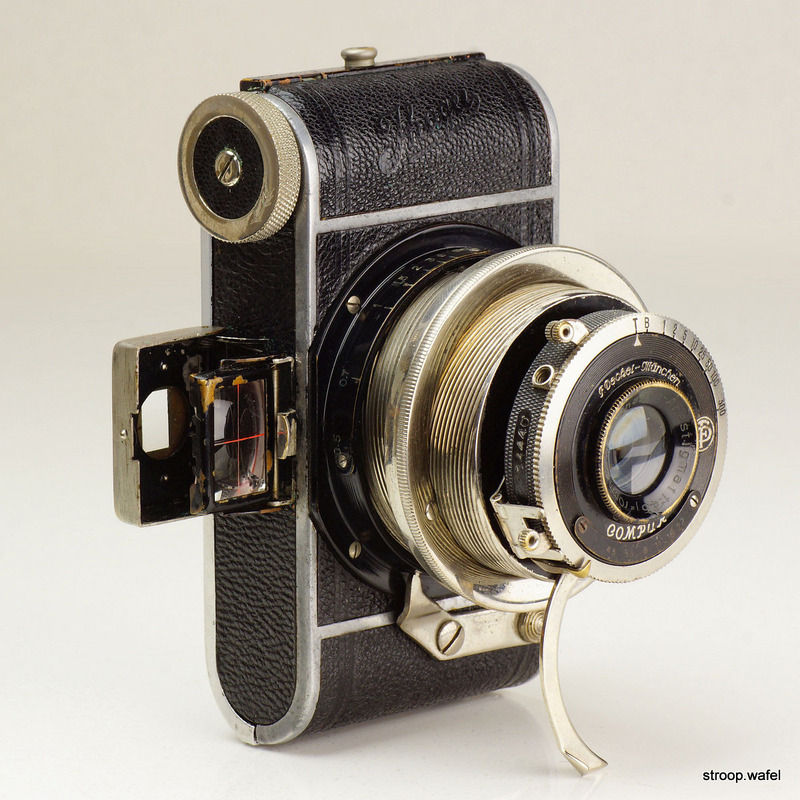 The Ihagee Exakta Varex started production in 1950 and was the first Exakta with interchangeable viewfinder, one could exchange the waist-level finder for an eye-level pentaprism. 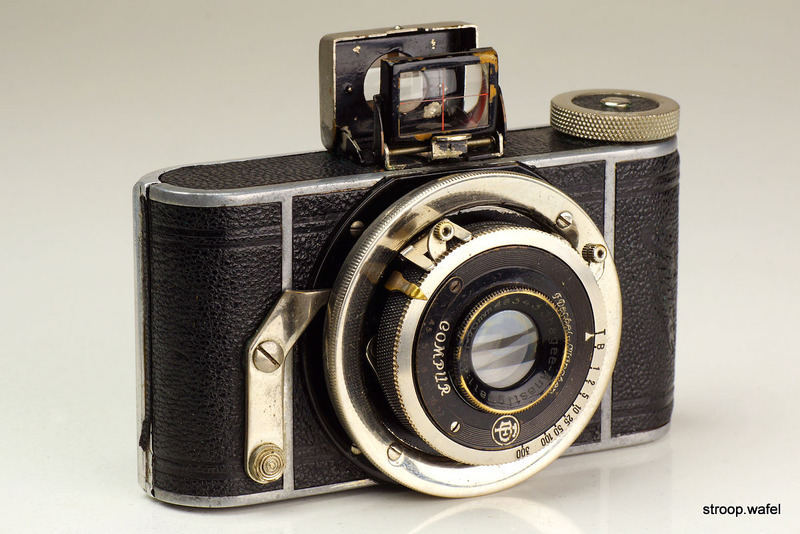 It was developed from the Kine Exakta, a 35mm film camera with interchangable lens mount introduced in 1936 and developed from the VP Exakta described above. These were not the most intuitive cameras, I really had to find a manual to get it to work properly. 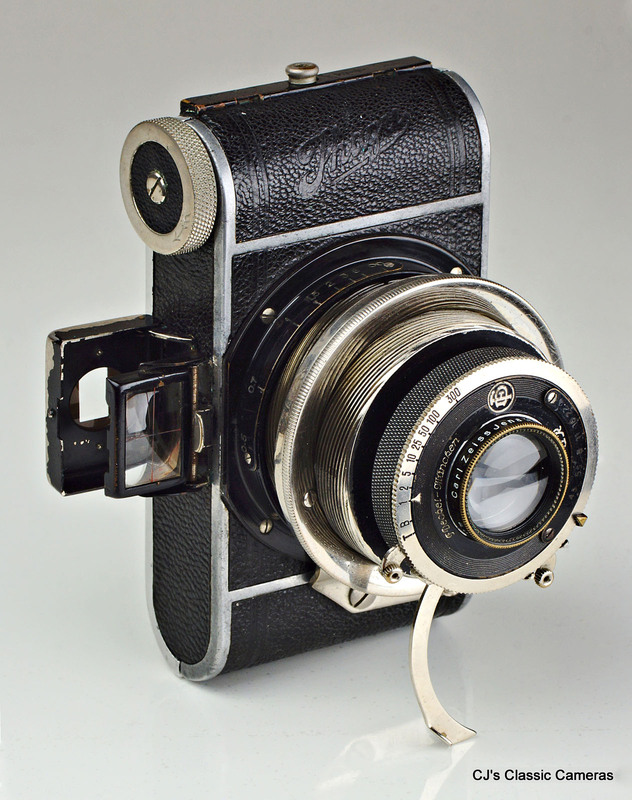 Considering that in 1950 Retinas still had wind levers and Iloca and King would just bring out their first very simple viewfinder cameras, this camera really was a marvel of technique. A large range of lenses was available for the Exakta mount, my model has an impressive looking Carl Zeiss Biotar 58mm f/2. With SLR systems, faster lenses give brighter viewfinder images, and the fast f/2 aperture certainly proves its worth. Unlike most other cameras on this site (but see here), it had a focal plane shutter instead of a leaf shutter. 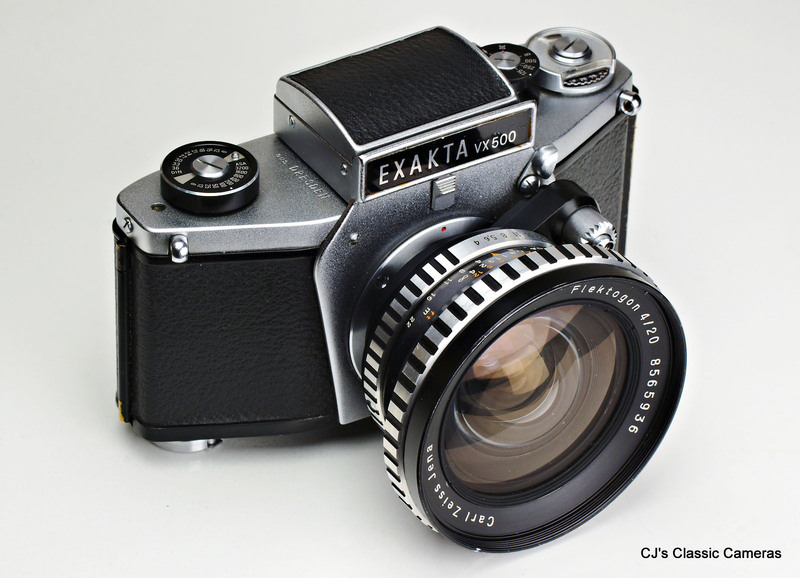 An Exakta Varex with waist-level viewfinder and interchangeable Carl Zeiss Biotar 58mm f/2 lens. 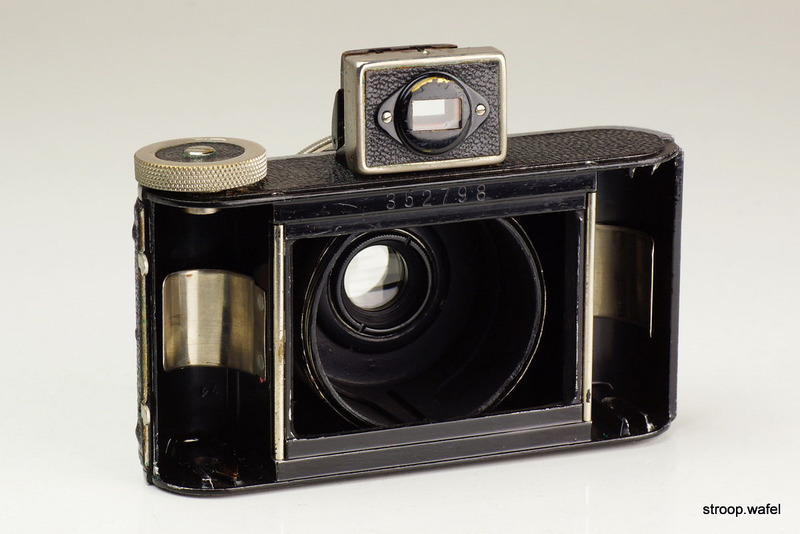 The Exakta Varex had an interchangeable viewfinder, it could easily be removed and replaced with a prism finder if needed. In combination with the interchangeable mount a very flexible system. Top view of the Exakta Varex showing the waist-level viewfinder. The aperture would close only when the picture would be taken. 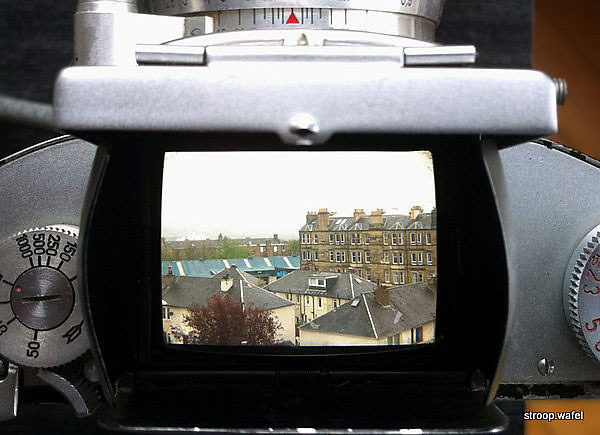 The waist-level viewfinder image, which is mirrored horizontally. The Exakta Varex was followed up by various newer models, but most of the changes were cosmetic and technologically not much progress was made. The main innovation was the instant return mirror, so that after taking a photo you didn't need to wind on to see an image in a viewfinder again. You'd still have to wind on to take the next photo, so it didn't really make that much of a difference in camera handling, but it was still a nice feature. The 1969 Exakta VX500 was the last of the line, it was a cheaper version of the VX1000, and missed long shutter speeds whilst having a fastest speed of 1/500s only (hence the name). More cameras bearing the Exakta name were produced later, but these were made by other companies that took over the name after Ihagee was dissolved. An Ihagee Exakta VX500 with the magnificent Carl Zeiss Jena Flektogon 20mm f/4 lens. This must have been one of the first ultra-wide angle lenses available. It doesn't quite match up to modern lenses, it suffers from quite strong barrel distortion, field curvature (the corners don't quite reach infinity focus), focus breathing as well as lateral chromatic aberration. Nevertheless, it has great sharpness and contrast, and the nearest focus distance of only 16 cm is great for creative photography. This is the sort of lens where SLRs really come to their own, I think, it would be difficult to exploit all its features on a rangefinder camera. The lens had an aperture which only engaged when the shutter button on the lens was pushed in, so if you have one of those and the aperture ring does nothing, don't panic! The Exa range was introduced in the early 50s, presumably as a cheaper alternative to the rather expensive Exakta range. They had simpler shutters and some lacked interchangeable finders but did accept the same lenses and accessories. 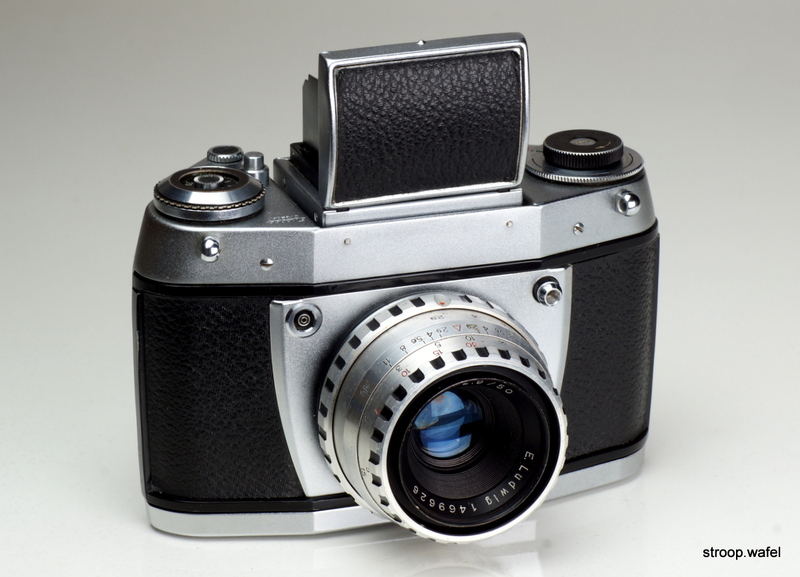 Only the last models, the Exa Ib and Ic, had an M42 screw-mount. 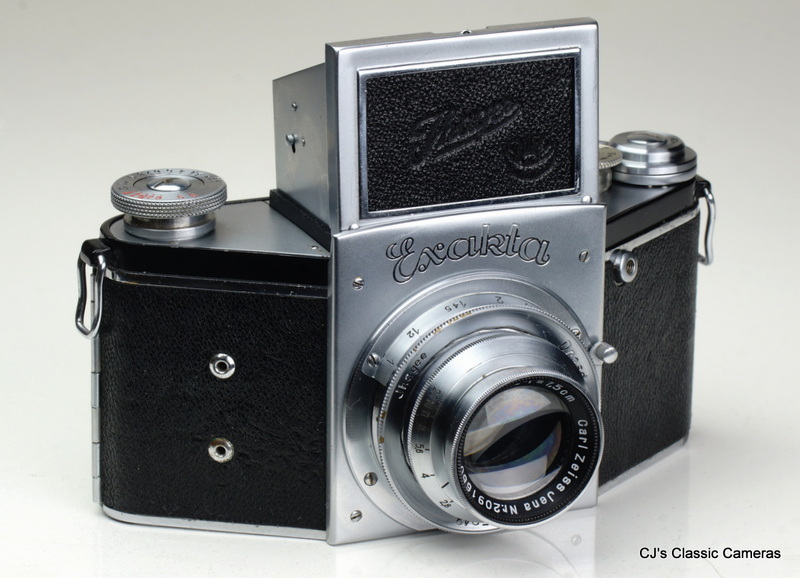 The first Exa, also the Exa 0, was introduced in 1951. 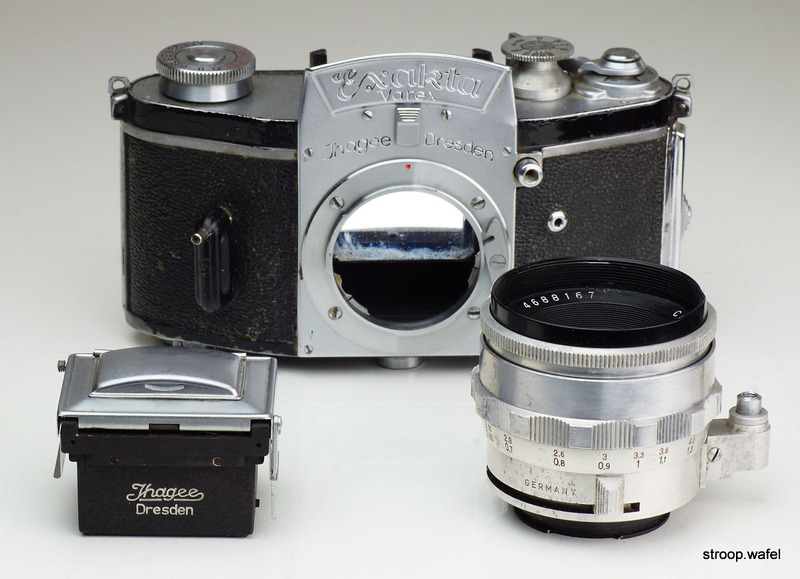 It was based on the Exakta but had much less features, like a much more limited shutter speed range of only 1/25 to 1/150s and a wind knob instead of a wind lever. However, most accessories, including viewfinders and lenses, were fully interchangeable between the two systems. The shutter worked differently than that from the Exakta; whereas the latter had a horizontally moving focal plane shutter like, e.g., Leicas, the Exa had a vertically moving shutter which was not located at the focal plane but was integrated with the mirror. An Exa 0 with Meyer-Optik Primagon 35mm f/4.5 wide angle lens and prism viewfinder. The drawback of slow lenses on SLR systems like this is that it becomes much harder to focus the lens, as the viewfinder image will be rather dim. Top view of the same Exa. The body shape is similar to the Exakta but backwards: the back of the camera is narrowest. Note the close focus distance of the Primagon lens, a mere 40 cm. 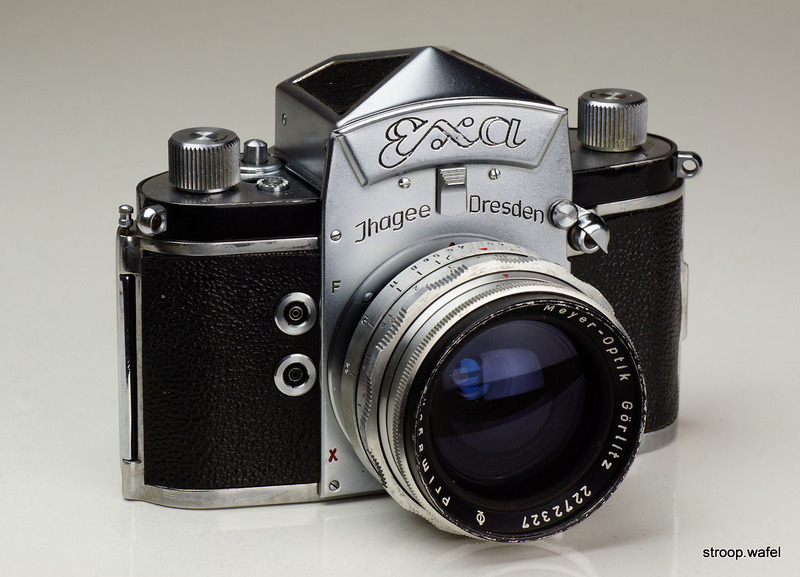 The Exa range was later expanded into the Exa I and II ranges, with and without interchangeable viewfinder, respectively. The latter also had a regular focal plane shutter. Both had redesigned bodies with a more rounded shape. Early versions of the Exa Ia still had wind knobs, which was replaced by a wind lever on later models. 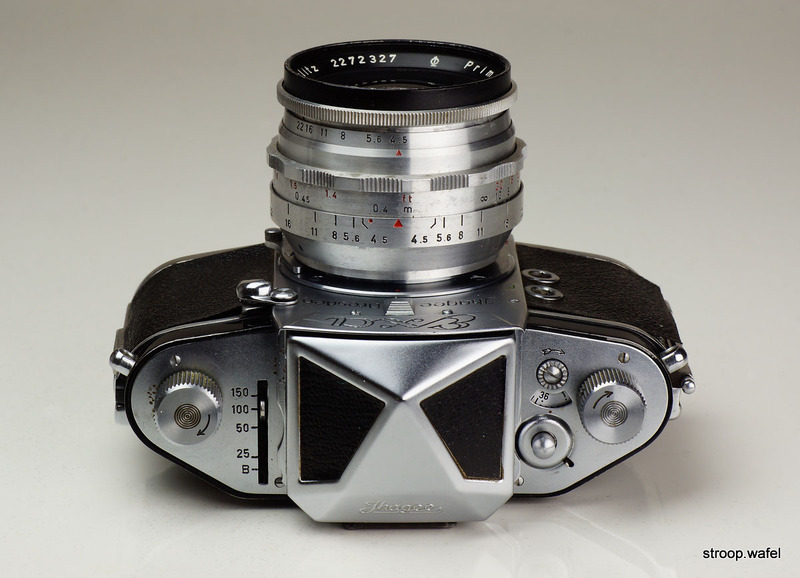 A 1965 Exa Ia with interchangeable waist-level viewfinder and Ludwig Meritar 50mm f/2.9 lens, the cost-effective lens most commonly found on Exas from this time. This lens missed the function to automatically set the aperture when the shutter release button was activated, but instead had a preset function that would limit the range of the aperture ring to the desired aperture. That way, one could first focus the lens with the aperture fully open and then twist the aperture ring as far as it would go to the rigt setting without having to take one's eye of the viewfinder. The badge with the model name on front of the camera is missing on this example. 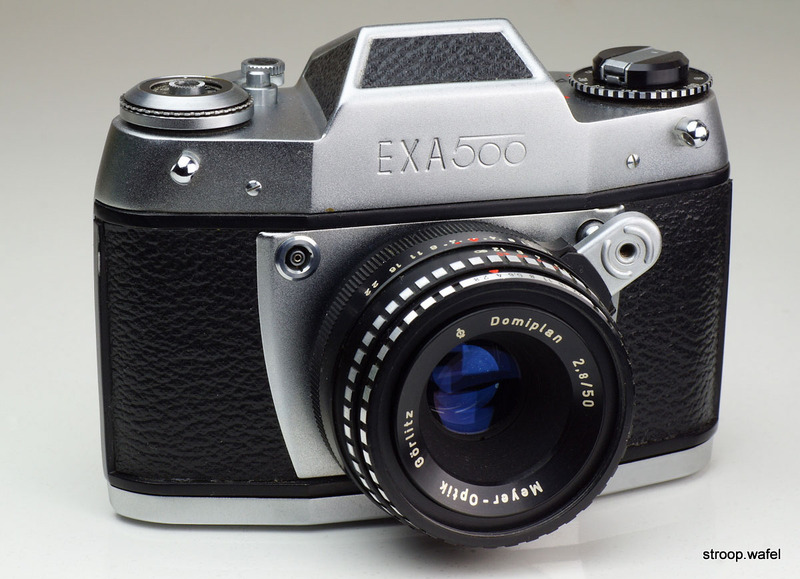 The Exa 500, introduced in 1966, was one of the last Exa models. 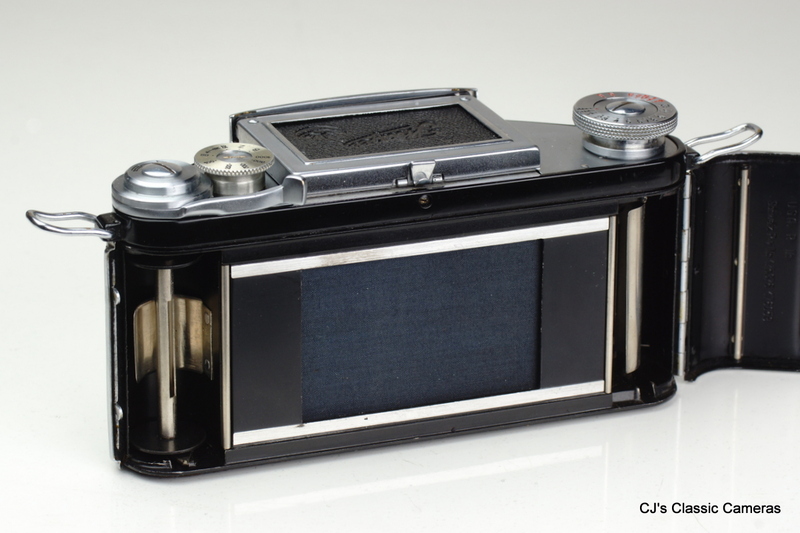 It was developed from the Exa II series, the line with fixed prism viewfinders. It had a for an Exa fast top shutter speed of 1/500s, but this was still slower than the 1/1000s of the Exaktas had from before WWII. This is a rather bulky camera compared to most of the view and rangefinders I am used to, but its body shapes makes it easy to hold and it feels reassuringly solid. An Exa 500 with Meyer-Optik Domiplan 50mm f/2.8 lens. This camera does perhaps not quite belong here, but as it was also made by Ihagee it probably fits here best. The Parvola was introduced in 1931 as the Klein-Ultrix (or Weeny Ultrix in English-speaking countries). The story goes that its name was changed to Parvola after a public competition. It was a 127 rollfilm camera that came in different versions, including 4x6.5 cm and 3x4 cm versions plus a later one that could do both formats as well as use glass plates. Some models have strap lugs next to the viewfinder whereas others do not; various sources suggest that early models had no strap lugs but this is disputed elsewhere. A 4x6.5 cm Ihagee Parvola without strap lugs sporting a Ihagee Anastigmat 70mm f/4.5 lens in a Compur shutter. 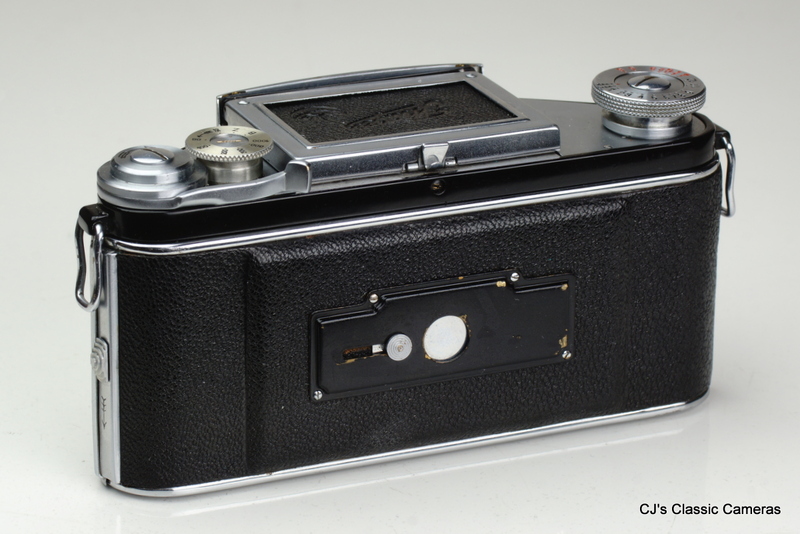 Based on the serial# 2334440 of the latter, this camera was built around 1933. The Parvola with fully retracted lens. The lever left of the lens is the infinity stop. The inside of the Parvola showing the 4x6.5 cm film gate. The camera serial number is 352798. A similar Parvola, here with faster Carl Zeiss Jena Tessar 70mm f/3.5 lens. The most striking feature of this camera was the double-helicoid telescopic lens which made the camera very compact with the lens in fully retracted position. The lens extended 18 mm by turning the focusing ring until one would hit the infinity stop. By pushing a small lever next to the lens one could focus the lens to closer distances down to 0.5 m, this would extend the lens another 14 mm. Going from fully extended (closest focus) to completely retracted would take only one full turn, making it quick and convenient. I am not aware of any other cameras at the time that had this ingenious double helicoid focussing system, but it was also used for the Kodak Medalist introduced about 10 years later. The camera also featured a neat little fold-out stand and a protective cover against accidentally firing the shutter when cocked. The viewfinder had a red cross marked on it, but I am a little unclear about how to use it as with one's eye to the viewfinder it is too fuzzy to be useful. A later Parvola (#413668) with same lens as the older example above, but with an Art Deco style Pronto shutter. This example has strap lugs as well as a film pressure plate, neither of which were present on the earlier example. On the other hand, it misses the latch to cover the red spy window at the back. Rear view of the same Parvola. The back door had a latch, whereas on the earlier model it was completely removable.